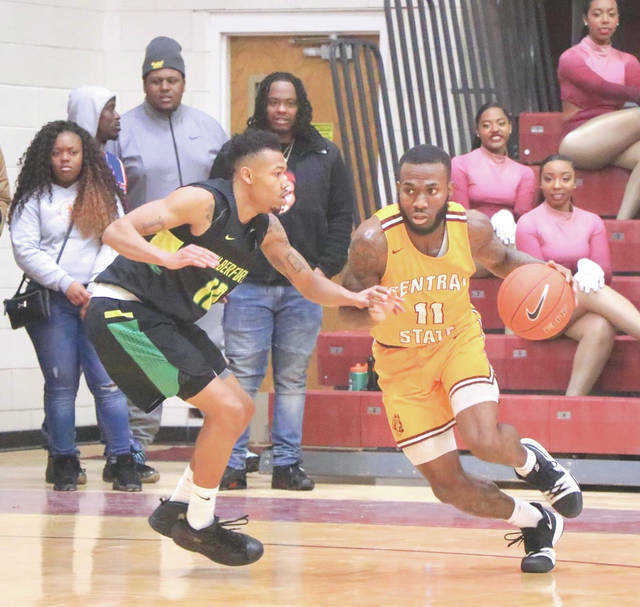 Central State junior guard Martin Oliver (11) led the Marauders with a game-high 18 points while hauling in a career-best 14 rebounds in a 65-60 win, Jan. 21 over Wilberforce University. Photo courtesy of Central State University. WILBERFORCE — The host Central State Marauders men’s college basketball team rallied past cross-road rival Wilberforce University for a 65-60 win, Jan. 21 at the Beacom/Lewis Gymnasium on the CSU campus. The Wilberforce Bulldogs (4-12) held a 52-45 lead with 11:11 left to play in the Monday afternoon contest, but CSU (4-16) battled back to tie the contest at 60-all with just 76 seconds remaining. From there, sophomore Quinton Glaspie went 4-for-4 from the free throw line and fellow sophomore Randal Clarkson, Jr. sandwiched the front end of a one-and-one free-throw opportunity between Glaspie’s trips to the line to enable the Marauders to rally for the win. The two universities are separated by roughly 0.2 miles, with CSU being on the northwest side of Ohio Route 42, and WU on the southeast side of the highway. Central State junior Martin Oliver led all players with a game-high 18 points while making seven of his nine shot attempts. He also pulled down a career-high 14 rebounds. Glaspie was four-of-eight from the field and seven-of-11 from the free-throw line to finish with 15 points along with nine rebounds. Tom Johnson, a junior, led all players with seven assists and four steals to go along with his eight points. Sophomore Isaiah Jones led the Bulldogs with 16 points and four rebounds. Sophomore LaJuan Marshall added 14 points. The Marauders will host Wayne State at 7 p.m., Wednesday Jan. 23 for their next scheduled game. Wilberforce returns to action that day as well. The Bulldogs next head to Oakland City, Indiana to take on Oakland City University for an 8 p.m. game on Jan. 23. The women’s basketball teams did not play each other on Monday. Those two teams met up back on Nov. 11, 2018, with CSU claiming a 59-53 win. https://www.xeniagazette.com/wp-content/uploads/sites/32/2019/01/web1_martin_oliver_PS.jpgCentral State junior guard Martin Oliver (11) led the Marauders with a game-high 18 points while hauling in a career-best 14 rebounds in a 65-60 win, Jan. 21 over Wilberforce University. Photo courtesy of Central State University. Game information provided by Central State University (maraudersports.com) and Wilberforce University (wilberforceathletics.com).